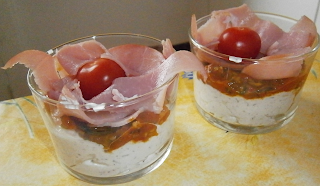 Today, let’s start with a verrine, as I like to prepare them, they are beautiful and fun! I particularly liked the goat’s cheese-walnut flavour. Preheat the oven at 180°. Mix the olive oil and the sugar, cut the cherry tomatoes in 2, baste with the oil and sugar and bake for about 25 min in the oven (check the oven so that it doesn’t burn). 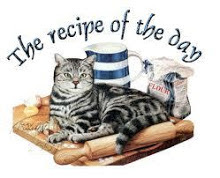 Mix the cheese with the walnut oil (the quantity depends on the taste). Add some pepper and mixed herbs. Store in the fridge. Cut the bacon in strips. Take the tomatoes out of the oven and crush them. Add thyme. Prepare the verrines: put some cheese, then tomatoes, and the bacon. Decorate with a cherry tomato and walnuts if you have some. You can put the bacon strips as it or fry them in a pan to obtain bacon chips.